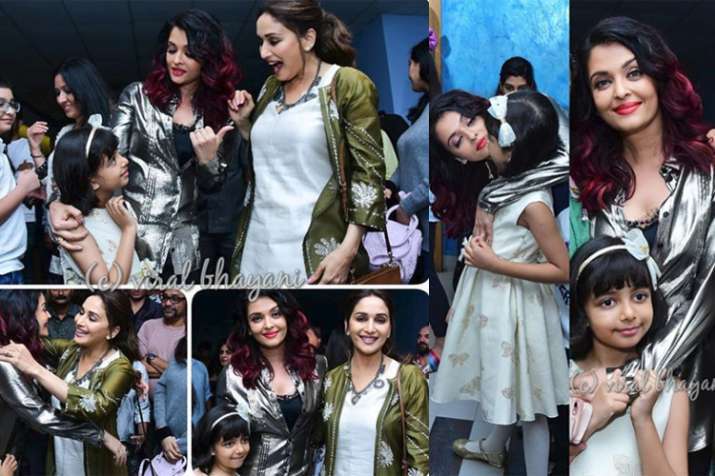 Aishwarya Rai Bachchan along with her daughter Aaradhya Bachchan attended the screening of her film Fanney Khan. Bollywood diva Aishwarya Rai Bachchan is known not just for her ageless beauty but for her high values and the way of leading an inspirational life. When it comes of family values Bachchan’s will always be in the top chart in the industry. And recently we got a proof of it during the screening of Aishwarya Rai’s latest release Fanney Khan. Aishwarya along with her daughter Aaradhya Bachchan attended the screening of her film. Many A-listers from the film industry including Madhuri Dixit, Shabana Azmi, Shah Rukh Khan, Sunita Kapoor, Rajkummar Rao’s rumoured girlfriend Patralekhaa, Tanvi Azmi, Manoj Bajpayee and others attended the special screening of Fanney Khan. At the event, Aishwarya introduced her little angel Aaradhya to the legendary stars. In a pic, we saw Aishwarya introducing Aaradhya to Madhuri. Aaradhya following the instructions of her mom greeted the veteran actress Madhuri. And Madhuri was impressed by it and her priceless expression was also captured by the shutterbugs. In another pic, Aishwarya and Aaradhya can be seen posing with the legendary actress Shabana Azmi. Aishwarya Rai, Anil Kapoor and Rajkummar Rao starrer Fanney Khan released today and the film is receiving positive response of audience nationwide. Fanney Khan is helmed by filmmaker Atul Manjrekar.